The current market scenario calls for desperate measures to minimize the damage if another recession is in play. For this reason preparing for the possibility of another recession is essential. The best way for damage control requires one to put in measures to minimize the hopelessness and make difficult business decisions. And what better way is there then to seek Counsel that can be implemented. Will we experience another recession? According to the Industry body ASSOCHAM warning the Indian IT firms may be forced to displace work force amid US tightening H-1B visa norms and rising rupee leading to lower software exports. After the US tightened the visa norms, later Australia announced the scrapping of 457 visa used largely by Indian IT professionals. 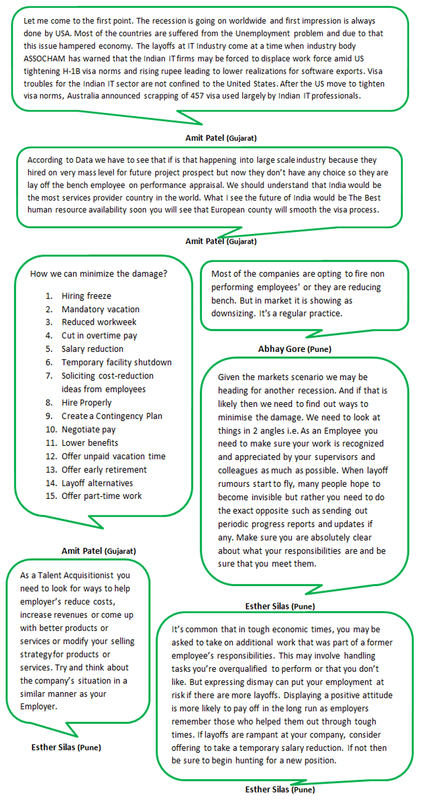 According to research it was found that if there are layoffs in a large scale industry it is due to hiring done on a mass level for future project prospect and when firms don’t have any choice but to cut costs they lay off the bench employee’s during the performance appraisal. Based on how the markets are there is a high possibility of India being the main service provider country in the world with the best human resource availability resulting in the European countries smoothing out the visa process. Most of the companies are opting to fire non performing employees’ or they are reducing the bench Employees. Increase revenues or come up with better products or services or modify your selling strategy for products or services. As an Employee you need to make sure your work is recognized and appreciated by your supervisors and colleagues. When there are layoff rumours avoid becoming invisible but rather the exact opposite such as sending out periodic progress reports and updates if any. Make sure you are absolutely clear about what your responsibilities are and be sure that you meet them. Take on additional work that was part of a former employee’s responsibilities which may involve handling tasks you’re overqualified to perform or that you don’t like. Display a positive attitude as you will benefit in the long run as employers remember those who helped them out through tough times. There you have it, possible solutions to assist you in minimising and controlling the damage which can be implemented. So now you know what to do if you hear of impending layoffs. If you’ve read so far then you can be certain that you’ve got the answer to the questions you had prior to reviewing these key take away pointers. Having, said that we’re certain that you’d like to be more of an Active learner rather than a Passive one. Hence, here are a couple of tips to help you become an Active learner. And one of our representatives will get back to you. In the meantime know that you’re prepared for an impending layoff if it occurs and therefore you’d be able to minimize the damage a recession can cause with the measures at your disposal. We’ve spoken about HR from a general perspective and dealt with challenges accordingly but have you wondered if there’s a difference between a Corporate HR and a Consultancy HR? As explained: see now – a – days many SME companies outsource their HR department to some Consultant or recruitment consultant. The Consultant place a recourse on client site to deploy HR practice or set up the HR department. In fact they get more exposure than co-operate HR. Still when these guys try to switch to a Corporate HR most of the companies reject the candidature just because these guys were working for a Consultant and not for companies. It is the same case for candidates working as a Recruiter applying as candidates. The key to understanding the difference is to see whether there is substantial data to support the argument. What really matters is the quality of experience than the quantity (number of years) or the brand name of the company for that matter. It is important for all of us to have hands-on experience and continue to keep your selves employable in the ever changing market scenario. While Recruiters are also Candidates who have great qualifications, great companies on the resumes nevertheless you may become redundant, in future, in the market place. Companies hire candidates for the skills they possess and the value they bring to the table. Companies don’t hire candidates because they have come from ABC school/college, etc. (or) xyz companies which is applicable across all levels. As a Corporate Recruiter you don’t share profiles with the hiring manager until and unless you find it 90 to 100 percent fit or if you are 100 percent confident. Recruiters try to look at the candidate from a hiring manager’s point of view before submitting the Candidate to them. The distinguishing factor is ownership; Corporate Recruiters will have the ownership on end to end processes. Corporate HR specialise in to recruitment where they directly interact with business personal and candidate wherein there is comparatively not much target pressure. Candidates from HR firms Source and come with complete market MI but not the last part of the operations therefore the preference changes according to the role requirement while hiring. These Recruiters come with wider market knowledge and understanding of companies, salaries, availability etc. Recruiter at a search firm usually share CV even if it’s 50 to 60 per fit with the thought of letting the 2 parties involved decide which doesn’t cause any harm sharing etc. Core consulting HR usually gets end to end exposure with a lot of pressure to achieve targets. 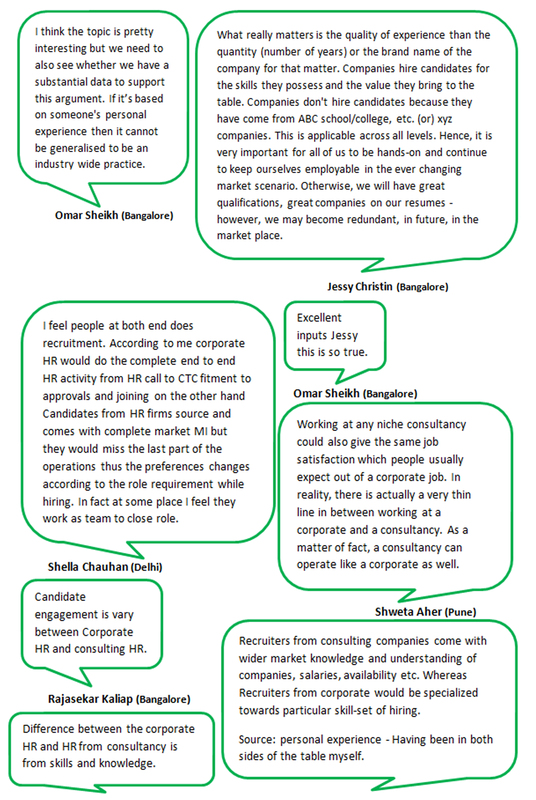 Here mainly the leads have stake holder connections and where recruitment is concerned most companies rely on consultants for on – boarding Candidates. Consulting HR policies change at the need of hour since they are controlled by owners which should not be the case. Things learnt and followed are different based on the exposure you get which is dependent on the firm you work for. b) DM us to @SourcingAdda with your Contact no., name and location and one of our representatives will get back to you. We’ve spoken a lot about trending HR practices for Employee benefit or Engagement in general and haven’t limited our thinking to any specific field. 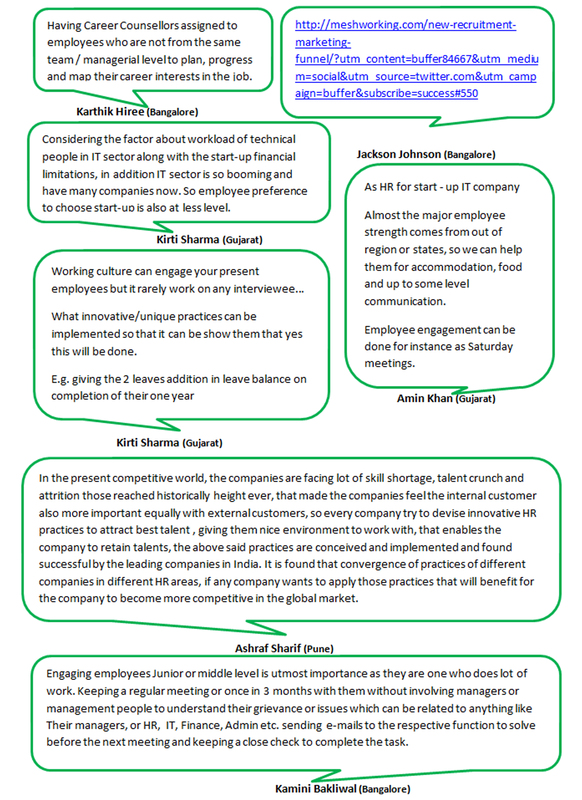 Therefore, in an attempt to get a better understanding as to the possible solutions for Employees we’ve conducted our popular WhatsApp discussions in relation to the IT sector. Have Career Counsellors assigned to employees who are not from the same team / managerial level enables one to plan, track the progress and map the Career interests in the job. Create a system that embraces all the complex process a candidate goes through when deciding whether to apply to the vacancy. The system created should simultaneously map out the commonly used methods that Talents use to satisfy their curiosity which help them make an informed decision about your company. Consider the factors involved such as the workload of technical people within the IT sector and the start – up financial limitations when engaging Candidates. Due to the IT sector being a booming industry with many new companies cropping up; giving Employees more options to choose from and find out whether a start-up is a good option which decreases the number of takers hence engagement is very important. 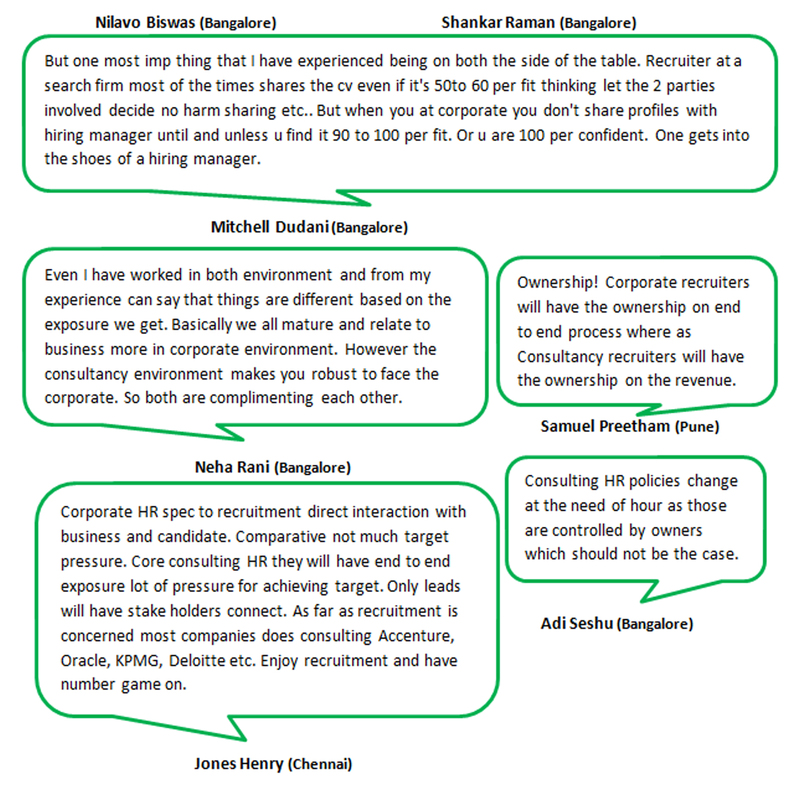 As an HR working for a start – up IT company; a major part of the employees are out stationed Candidates i.e. region or states hence Recruiters can help them in areas like accommodation, food and some level of communication which benefit a potential Employee are good practices to follow. You can set aside a day that mainly focusses on Employee engagement such as hold meetings on a Saturday and let Employees discuss how they find the company culture and work given can be another good practice to follow. The above mentioned practices that were decided on and implemented have been found to be successful in leading companies in India hence they are good practices to follow. Rewarding them with 2 leaves in addition to their leave balance on completion of one year with the organisation, can be an incentive to retain Talent. Organising regular meetings or once in 3 months with Talent without the involvement of managers or management people helps to understand their grievance or issues which can be related to managers or HR, IT, Finance, Admin etc. can be a good incentive to retain Talent since it shows that you care. Even sending e-mails to the respective of the function to resolve any issues Talent face well before the next meeting and keeping a close check on the completion of tasks can also help engage Talent and retain them. Work culture can engage present employees but there’s a harsh reality that it may rarely work on any interviewee. In the present competitive world companies face a lot of skill shortage, talent crunch and attrition that have reached historical heights which makes companies realise that the existing internal customer base is equally important as with external customers. Given the competitive scenario companies are required to devise innovative HR practices to attract best Talent. It has been found that convergence of practices of different companies in different HR areas, where other companies have applied such practices that are beneficial to the company requires them to become more competitive in the global market. Engaging employees whether Junior or Middle level are of utmost importance as they are usually the ones that work a lot. Follow us @SourcingAdda to gain real time updates to our upcoming events like #TASCON17 and activities like #TweetChat #TASCON17 having Two consecutive years of success with #TASCON15, #TASCON16 & #TASCON17, Bengaluru now Sourcing ADDA presents #TASCON17 Pune! b) Send us a DM to @SourcingAdda with your contact and location details and our representative will get back to you. There has been a lot of talk on Candidate Engagement and its importance but do you know the Best Practices in Candidate Engagement and Tools utilised? Therefore spend time thinking about what your message and engagement strategy in the market will be over the next 6-12 months and measure the impact simultaneously. 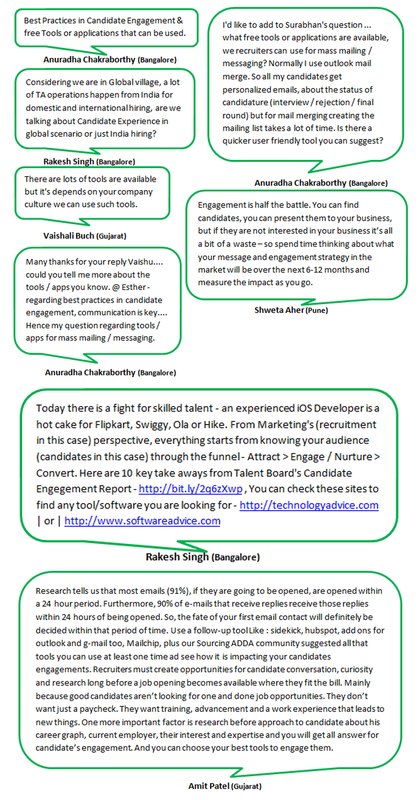 For successful Candidate Engagement, communication is the key, hence tools / apps for mass mailing / or messaging are required. Based on Research most emails (91%), if they are going to be opened, are opened within a 24 hour period. 90% of the e-mails that receive replies, receive replies within 24 hours of being opened hence the fate of your first e-mail contact will definitely be decided within that time period. Recruiters must create opportunities for Candidate conversation, curiosity and research long before a Job opening becomes available where they fit the bill. Good candidates aren’t looking for one and done job opportunities and they don’t want just a pay – check. They want training, advancement and a work experience that leads to new things. Do your research before you approach a candidate about his career graph, current employer, their interest, expertise and you’ll get the answers for Candidates Engagement. Sourcing ADDA community tips or tools and use them at least one time and monitor the impact it creates on your Candidates engagements. Follow us @SourcingAdda to gain real time updates about our upcoming events especially the annual event #TASCON17 Pune & activities. b) Send us a DM to @SourcingAdda with your name and contact details and one of our representatives will get in touch with you.